Preparing and preserving left over meat was a recurrent task for the cook or housewife living in the 19th century. At this time very few people had refrigerators and so meat had to be cooked and eaten, soon after it had been purchased. 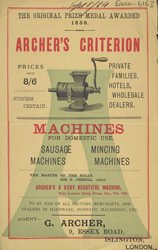 Mincing machines like the one featured on this leaflet were introduced in the 1850s and were immediately very popular. Scraps and leftovers could be minced together and seasoned and made into pies to be eaten for the following day’s lunch.